Impressionist and comedienne, Francine Lewis captivated the British public and celebrity Judges on Britain’s Got Talent with her uncanny impersonations of some of the biggest names in entertainment. She instantly became a huge hit, winning the public vote in the semi finals and making it through to the final. On the show, Francine was described as ‘unique’ and ‘incredible’ by Amanda Holden and David Walliams. Alisha Dixon said she ‘cant wait to see her future shows‘ and Simon Cowell said she was ‘a star’. Francine is still the only female impressionist comedian to ever make the live shows and online clips of her performances went viral, becoming the most viewed clips from BGT, watched by millions world wide. Since Britain’s Got Talent, Francine’s success continues – appearing on TV’s most loved shows including This Morning, Good Morning Britain, Loose Women, Celebrity Chase, Sunny Side-Up and many more. 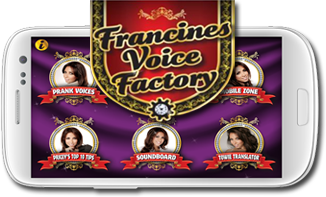 For the past 6 months, Francine has toured her show through out the UK and is currently developing a new live show to be toured in 2015. As well as being one of the UK’s most exciting impressionists, renowned for her mimics of Sharon Osbourne, Cheryl Cole, Kim Kardashion and even male celebs including Alan ‘Chatty Man’ Carr, Francine is an experienced comedy actress. She has played leading theatre roles and starred in West End pantos Cinderella and Snow White. Francine who is currently working on a new TV project, is a popular booking for corporate gigs and has been hired to perform at a number of hi-profile celebrity private parties. She’s also worked with a number of fashion and beauty brands for endorsements too. Click here to get a personal video message from Francine lewis. For Birthdays, Weddings or just for fun.